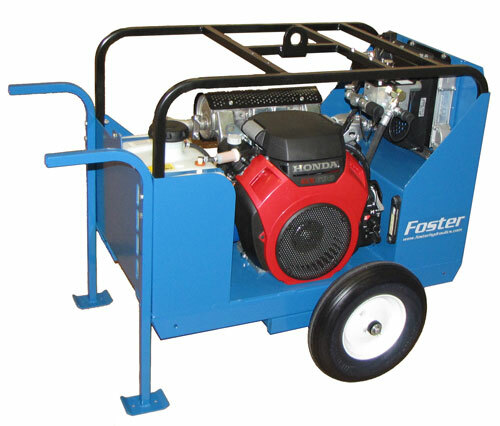 This Power Unit was designed to operate various Hydraulic Tools, Jacks and Cylinder applications. Various Reservoir Sizes, Pressure and Flow Rates available. Model 24CS-2WK - Wheel Kit Assembly. (2) 4:80/4:00 Flat Free Type Tires, 2-Bolt-on Support legs and handle assemblies with required hardware. Model FMTK-15 - Flow Meter Kit. Includes 1-15 G.P.M High Pressure Flow Meter, Connecting Hoses and Quick Couplers. Model HDV-4-3-M - Manual Directional Control Valve Kit. Consists of 4-way, 3-position Manually Operated Directional Control Valve, Tandem Spool, Spring Loaded to Center Position. Includes mounting plate with hardware,(2) Required connecting pressure hoses and required Quick Couplers to attach and Work Ports. Model SOV-T-3-4-P 12-Volt Solenoid Operated Directional Control Valve Kit. Consist of DO5 Size 4-way, 3-position Directional Control Valve, Monted on a DO5 Sub-plate. Includes mounting plate and hardware, (2) required connecting pressure hoses, Electrical Box with connectors, Required Quick Couplers to attach and Work Ports. A/B Hand Held Pendant on a 20 Foot Cord Set. Fused power Supply cable with Fuse Protection to the battery.